This visualization is meant for daily focus. It is also how we will begin the next Major Love Prayer! You may wish to bring a sacred feeling to your practice by lighting a candle or burning sage or a favorite incense to purify your meditation space and enhance your quiet mood. It is strictly a matter of personal preference. Sitting in a comfortable chair, take several deep, cleansing breaths, inflating your diaphragm first and then your lungs and filling your inner space with the white or golden light of love. Allowing your mind to be cleared of all thought, expel any negative emotion with your exhalations, emptying your lungs first and then your diaphragm. You may wish to ask your angels and guides to be present and to guide your spiritual practice. And it is in dying that we are born unto Eternal Life. Amen. When your mind is quiet and your breathing feels natural and comfortable, visualize the millions of children all across the world, on every continent, smiling and healthy. See that all children are perfectly healthy, having received all care they need. They have proper nutrition, sanitation, shelter, medicines and medical care. They all survive. Not one child is lost. All preventable diseases are quickly healed, leaving only happy, playful children brimming with energy and joy! 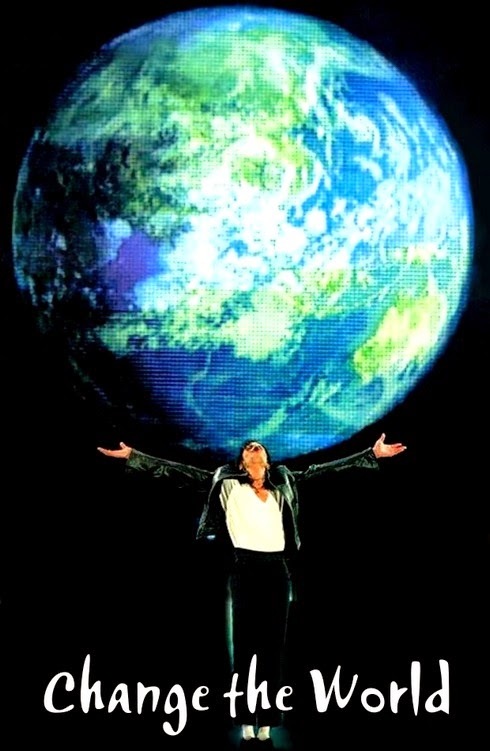 If it helps you to visualize, watch the video for We Are the World or for Man in the Mirror... see the change that occurs halfway through when the people of the world take steps to help! Pour all the love your heart can hold into the intention that all children are healed of preventable diseases ~ no child will die of a preventable disease on August 25th. Know that Michael joins his prayers and intentions to ours and that all of God’s universe joins us in our visualization to create peace. Repeat this visualization, if you wish, to anchor it firmly in your awareness. On the repetition, you may want to add your intention that on August 25, 2012 all children are healthy. Feel the joy of that minute of silence and extend that joy and peace outward to blanket the planet. Feel our great love for our beautiful, blue planet and all her inhabitants. On the day of Major Love Prayer (the 25th), know that you are joined by thousands of others in every corner of the world. Feel their presence. Feel the love we all share … for each other … for our planet … for our beautiful Earth Angel. Focus that love like a laser beam upon our planet. Visualize joining hands all across the world to blanket the planet in our love. You may wish to add prayers for friends or loved ones experiencing health or personal problems. Finish your visualization practice with a prayer of thanksgiving for your intention being made manifest in this physical reality. Thank Michael for being near and joining his intention with ours as we heal this violation of our common human spirit. Thank him for bringing us all to Come Together Over Michael Jackson. Thanks to Jan from WithAChildsHeart'sBlog for this beautiful visualization. 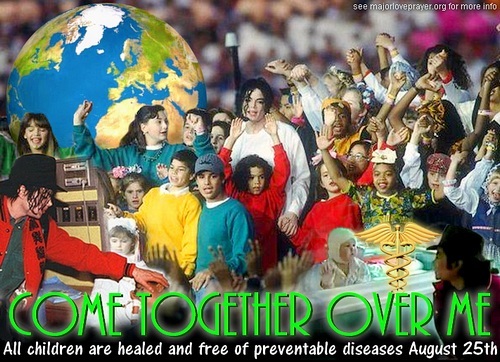 For more information on this intention project, please see Come Together Over Michael Jackson here on MLP, or visit the "Come Together Over Michael Jackson" Facebook event. Thank you and much love! St Francis' prayer is one of the most beautiful prayers I've ever encountered (and I was raised a Catholic, so there have be, ahem, a few of 'em!) I carry a medal of St Francis with me when I travel, along with on of St Christopher and, of course, St Michael. 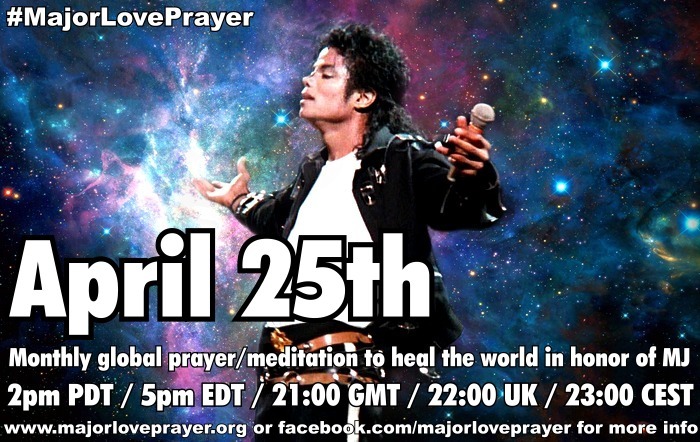 I will be joining in as usual for this wonderful prayer intention. Love you all.